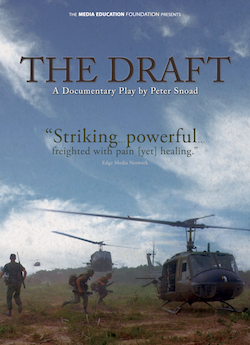 The Draft is an award-winning documentary play that explores the tumult of the Vietnam era through the real-life stories of 10 young Americans — eight men and two women — whose lives were shaped and forever changed by the military draft in the U.S. during this period. Dramatically enhanced by archival photos, film clips, and music, the play chronicles the choices these ten individuals made when confronted with the draft and the impact of those choices then and since. Written by Peter Snoad and based on the book Called to Serve by Tom Weiner. The transcript will be e-mailed to people who purchase the film for use in the classroom. Would you like to license the play for production? Contact the playwright. "A monumentally important new play. Has the potential to reach history classrooms and new generations while bridging to veterans and current soldiers." "Striking . . . powerful . . . freighted with pain [yet] healing."